Last week the Philadelphia Daily News ran a story about unemployment with a photo of a middle-aged man in a business suit — a former office worker out of luck and money — begging for a job on a streetcorner in Center City. Reading the story at my shack in the Tinicum swamp, I thought: 1) There but for the grace of God and a few thousand bucks go I, and 2) The only thing worse than having a soul-killing office job is having no job at all, and 3) the guy in the DN story needs to make a survival plan, as Walter White did in the TV series Breaking Bad. Good question. I confessed to the rabbit that I’m too ignorant to make a go of it in the digital world and not a good enough thief to prosper in financial services. I don’t have the commercial instincts to make money writing fiction, the racket in which I’ve invested most of my time and energy, and I don’t know enough chemistry to cook high-quality methamphetamine, the substance that has saved Walter White from bankruptcy and worse. The next time I get hit with a serious health- or housing-related expense, I’m busted. I’m not alone, I added. In my rare unselfish moments, I wonder what will happen to the hordes of recent college grads in debt up to their ears, fighting to land jobs in a country run by a small group of self-obsessed jerks who grow their personal fortunes, and those of their investors, by cutting wages and killing good jobs. And what about the older workers being fired left and right and, in many cases, robbed of their pensions? We are living in a zero-sum economy – in which a handful of investors and owners win at everyone else’s expense. But ultimately, it will catch up with investors, too. The U.S. economy is engaged in a vicious cycle in which low-wage jobs and under-employment stimulate little demand, giving companies little reason to hire workers. Would-be workers then get discouraged and drop out of the workforce. They lack money to buy things, so consumer spending sags and companies don’t hire or offer raises to workers they know they can keep. Repeat. Meanwhile, our elected officials, who are owned by the corporate bosses and the financial wizards who wrecked the economy, are working to put home ownership, higher education and decent medical care out of reach for most Americans. The deck is stacked against us. The Breaking Bad writers knew this was the key to making Walter sympathetic — show the deck was stacked against him. He’s a family man who had worked hard at a regular job and had always paid his taxes but ended up, because of lung cancer, with debts he couldn’t repay without becoming an outlaw. Who in Walter’s situation wouldn’t break bad to save their families and homes, if they thought they could get away with it? More importantly, how bad is the drug kingpin Walter compared to the kingpins who created and nurtured our zero-sum economy — George W. Bush, Bill Clinton, Robert Rubin, Lawrence Summers, and so on. In the same room with such swine, Walter would smell like a hero. This entry was posted in economic collapse, globalization, Goldman Sachs, Great Recession, humor, mainstream media, Philadelphia, unemployment and tagged Breaking Bad, George W. Bush, Lawrence Summers, Philadelphia Daily News, Robert Rubin, Tinicum, Walter White. Bookmark the permalink. 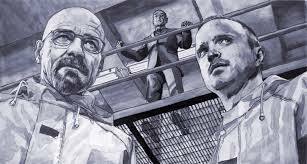 Long live walter white, if i knew how to cook high quality meth, I would give ir a try as well.